Spread oats and pecans over two cookie sheets or glass baking dishes. Cook for about 30 minutes, stirring or shaking every 10 min or so. When the oats and nuts begin to smell fragrant they are about ready to come out of the oven. While oat mixture is baking, mix remaining ingredients in a large bowl. After removing oat mixture from the oven, allow it to cool. When oat mixture is cool enough to handle, add to the bowl and toss to combine. Store in an airtight container (such as in 2 quart mason jars). 5 to 30 minutes before eating (according to your tastes), add milk (I love using almond milk in this recipe) and allow muesli to soak. 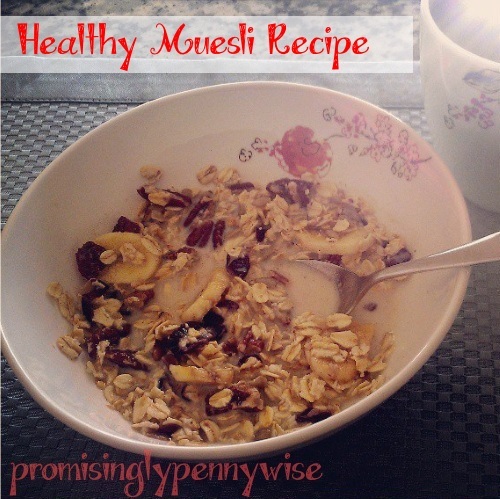 I add at least enough to cover the top of the muesli but the amount can be adjusted to taste.